If you are looking for information on the 123 Refills franchise business opportunity, 123 Refill franchises or 123 Refills franchising, then you have come to the right place. 123 Refills™ started in 2002 as an online superstore for ink and toner refills in the USA, and quickly grew to become a world-wide recognized brand and one of the world's largest online destinations for printer supplies. 123 Refills stores offer remanufactured and compatible inkjet, laser toner and other cartridge types at substantial savings compared to buying original cartridges. The stores also offer refill services for most popular models, saving the customers even more when they bring in their empty cartridge to have it professionally refilled and remanufactured by 123 Refills. The key to the product quality and customer satisfaction success for 123 Refills lies in its 3 step remanufacturing process - CLEAN, REFILL and TEST. At 123 Refills we believe in working to make all of our dreams a reality...whether it's a relaxing day at the beach or a brighter future. Our premise is simple. 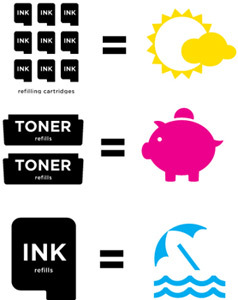 We refill ink and toner cartridges...which helps to make the world a better place. We'd like you to join us. This is your day in the sun. Saving money on ink doesn't mean that you need to compromise on quality. Our unique three-step remanufacturing process ensures that our products will perform like new. 123 Refills guarantees 100% satisfaction with all of our products. 123 Refills professional and knowledgeable store personnel provide customers with options and the information to help them decide what's best for their needs. But our service doesn't end with a sale - we're always available to answer questions. Everyone likes to save money...123 Refills offers both great prices and a unique shopping experience. We appreciate our customers and their repeat business. Our success reflects the overall value that we provide. Why Franchise with 123 Refills? U.S. consumers print trillions of pages every year. Only half of them have ever bought a remanufactured inkjet or toner cartridge. This huge untapped market would like to save money on ink...but they need a trusted, convenient source to get it from. That's where we come in! Recycling printer cartridges keeps tons of trash out of landfills. People want to be globally responsible - you can show them how. You and your customers will be making our world a cleaner and healthier place to live. Join us and we'll make a difference together! Our patented three-step approach ensures that we meet our customers' expectations and deliver the highest quality products. Our process sets us apart from our competitors. This is the essential key to our success and it's what keeps our customers coming back. All cartridges are thoroughly cleaned and inspected for defects and wear. Old ink or toner is evacuated and the cartridge is prepared for refilling. Cartridges or parts that don't meet our quality standards are removed from the production line. Only the highest quality components make it through to the next step. Each cartridge that has met our quality standards is then professionally refilled with our patented formulas. Every cartridge that is refilled is first tested to ensure that it has been filled to equal or more capacity of the original. In some instances, we can refill cartridges up to 200% the capacity of the originals. The cartridge is then tested on a physical printer to ensure that it meets or exceeds our strict quality standards. Only the highest quality cartridges make it through all 3 steps. 123 Refills offers three weeks of initial intensive training including on-site support and training for new franchisees. Ongoing support is provided via telephone, online and on site visits. 123 Refills software technology is continuously updated to push new information to franchisees about new printer / cartridge releases, technical information, sales material and other vital technology updates to its franchisees. The company is on the forefront of R&D into new cartridge refilling technologies, and supports its franchisees with a centralized product distribution ensuring faster and more efficient product sourcing and delivery.